These medications are often called neuromodulators, because they effectively put our muscles on a holiday. 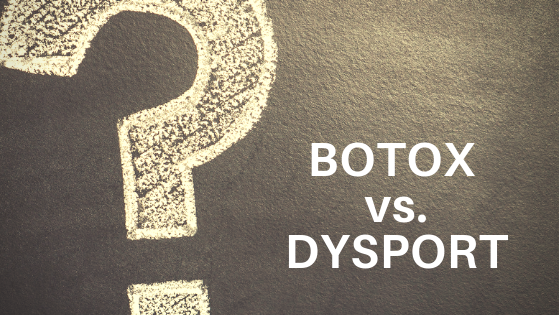 Patients have been asking us what the difference is between Botox and Dysport (pronounced “dis-port” in the US, “dI-sport” in Europe…you’re so in the know! 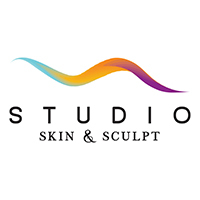 ), both of which we offer at Studio. Technically, they work the same way, effectively relaxing dynamic muscles. They contain the SAME amount of active medicine. Don’t let the differing unit measurements confuse you…just leave that up to your injector. For instance, to treat the glabellar (furrow to see those muscles) would require 20 units Botox OR 50 units Dysport. Please don’t ask why the measurements differ. I’ve asked the reps and the explanations never stick, so I’m assuming the importance was insubstantial. * There is nothing limiting you from participating in both programs, so you should! * This is info noted by the manufacturer, however we tell patients for either neuromodulator that results vary by individual (and metabolism). Regardless of product, we check in for a 3 month appointment. You’ll know when it’s starting to wear off. 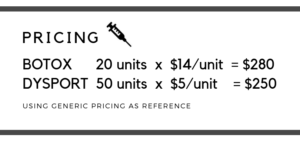 Pricing per unit is different, so ultimately there is a slight difference in total price. One isn’t delivering the expected results for at least a certain duration of time. This could mean the client has a resistance to the medication. This is rare, but possible. We suspect there may be an allergy. Otherwise, the 2 medications can be considered interchangeable. Some clients prefer one over the other…perhaps it’s a loyalty thing, like going with Alaska miles. If you have a preference, just let us know.